Tonnages: 16,646 gross, 9,781 net, 26,930 deadweight. Main Dimensions: 574.5 x 84.5 x 32.4 feet. 1976: Completed by Govan Shipbuilders Ltd., Glasgow (Yard No. 215) for Lyle Shipping Co. Ltd.,Glasgow. Scottish Ship Management Ltd., Glasgow, managers. 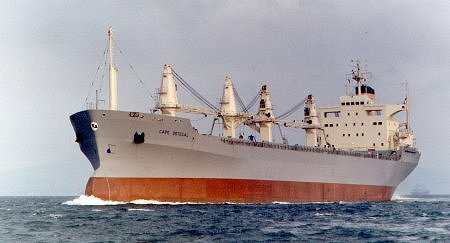 1982: Sold Stanhope Shipping Ltd, Eastern Bulkers Ltd., Hong Kong, managers, Hong Kong flag, renamed KILMUN. 1986: Sold Andromeda Shipping Lines Corporation Inc., Manila, Perseus Shipping Co., Ltd., Tokyo managers. Phillipines flag. Renamed ESPERANZA V.
1989: Sold Thornleigh Ltd., Naviera Delena S.A. managers, Liberia flag, renamed DELENA I. 1992: Sold Aboitiz Jebsen Bulk Transport Corporation, managers, flag retained, renamed VIZCAYA. 1993: Sold, Axion Shipping, Almana Transport Ltd., managers, Cyprus flag, renamed ANDAXIOS. 1998: Sold Raypak Commercial Corp., Golden Union Shipping Co. S.A. managers, Panama flag, renamed FLAG MARU. 2001: August 2nd. Broken up at Mumbai.